The uTorrent Bittorrent client is without doubt one of the most popular torrent download programs available on the Internet in these days. It is regularly updated and still relatively lightweight, even though this has been tainted somewhat by the introduction of ads and toolbars the client ships with these days. If you have installed uTorrent recently on Windows, you may have noticed that the installer is not providing you with an option to set a different installation directory. Instead, it will automatically install uTorrent in %AppData%\uTorrent. I have verified this during installation of the current stable build, the beta build and the 3.4 alpha build that are all available on the official website. Note that this has been tested on a clean system, meaning with no uTorrent version installed on it prior to running the installers. Select the language of the client. Choose install options (start menu entry, quick launch icon, desktop icon). Configuration (exception to Windows Firefox, start uTorrent on Windows start up). And that is it. There is no option to select a different installation directory for the application. What if you do not want to run uTorrent from the %AppData%\uTorrent directory on Windows? The only option that you have is to move the folder to another location. Simply move the full uTorrent folder to another location on your computer, e.g. c:\program files\ or c:\ or wherever you want it to be and run the application from there. You are probably wondering why the change was made. According to the uTorrent forum, it was made so that updates can be installed without UAC. 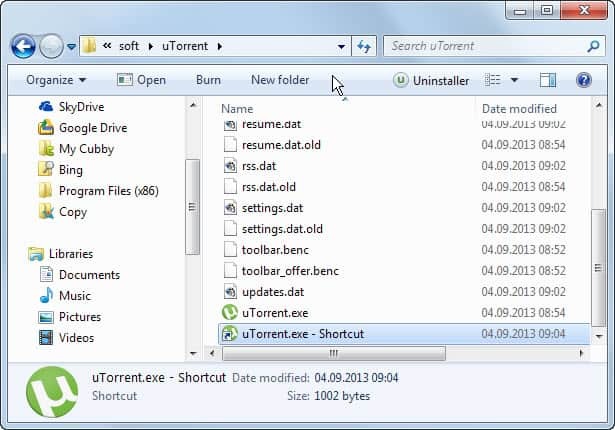 While it is relatively easy to move uTorrent to a new location and run it from there, you may want to run it from the start menu or desktop as well to speed things up. This can be done easily as well. Just open the directory you have moved uTorrent to and locate the uTorrent.exe in root. Right-click the file and select Create shortcut from the list of options in the menu. All that is left to do now is to move the shortcut to the desktop, start menu or taskbar. Depending on its location, you should be able to move it multiple times. If not, create multiple shortcuts and move them to the locations you want them to be available in. You may also want to modify the directories the file downloading and sharing client uses. To do so, open Options > Preferences or hit Ctrl-P and switch to Directories here. Put new downloads in: This is the temporary download directory. Move completed downloads to: Where you want finished downloads to be moved to. New uTorrent versions seem to be installed in the default installation directory again, so that you need to move them - again - to the desired location you want to run the application from. Why not use the portable version of uTorrent? Just downlad the .exe from official website into a folder, create a text file in the same folder, rename the .txt file to settings.dat and start uTorrent. You can move the folder anywhere. ^Exactly…. in fact I would recommend avoiding all versions over 2.0, the torrent portion of the program hardly changed, it’s all the ads, ratings, and possible tracking features that require all the additional installs. Nope. I donated $25 several years ago to the utorrent crew.. possibly a decade… so I refuse to accept their reasoning for selling out so much. You can turn off the ads. Qbittorrent your way out of this piece of crap. I’m a long long time user of Bitcomet now and forever. Never any ads, no offers, nothing to decline, no sell out… little used due to the complex nature they still scare people away with, but their new install is a simple one click solution that discovers all settings on its own except firewalls. They follow a simple idea…’share’… if you share you can possibly go faster than those who don’t share. You can even see connections* connected to you and of them who is sharing and who isn’t… then you can boot them / ban them or ignore them selectively ‘mwahahaha…’. We can set how much we share, with who, and how fast we share. *in my personal experience over 95% of Azures and uTorrent users do not share, I boot them. So those who believe Bitcomet is hard to understand, they haven’t been that since version 1.09a (current public release 1.35). Also Bitcomet installs a Firefox add-on to capture media from the temp directory. You can easily unload it using Firefox’s Add-on Options page. Bottomline, Bitcomet is faster and easier to install/use. Signing up as a registered user will allow you to join the ranks as a sharing user. The more you share, the faster you can possibly go. utorrent installs itself in appdata folder so it can inject malware without the UAC consent. Don’t use utorrent because it’s unsafe!